It’s a sad day in America. It’s another sad day in America. On any given day, it’s a sad day in America. On this particular day, we are reeling from the live, on-air, real time execution of a local news reporter and her cameraman. They were reporting not from a war zone, but from a water park in Roanoke, VA. The subject of this first-thing-in-the-morning report? Tourism and an interview with the Executive Director of the local Chamber of Commerce. Alison Parker, 24 years old, is dead. Adam Ward, 27 years old, is dead. Vicki Gardner underwent emergency surgery for wounds she sustained. The gunman is dead from a self-inflicted gunshot wound. On this week when school children all across America are back in class, already a 14 year old held his entire class and teacher hostage at gun-point. Mercifully, his teacher was able to talk him down before anyone was shot. An 8 year old accidentally shot another 8 year old on the first day of class — while playing with a gun in his desk. This morning the shooter convicted of killing 12 people and injuring another 70 when he opened fire in a crowded theater in Aurora, CO, was sentenced to 12 life sentences without possibility of parole. 12 families will never see their loved ones again. 70 more families will deal with the aftermath for the rest of their lives. Most often when I write a blog entry, I’ve planned out what I’m going to say. I”ll post a sermon I’ve preached. And though I’m passionate about gun violence any day of the week or hour of the day, I may not be actively angry when I write. Today is different. I’ve had enough. I’m angry. I want to forget the times in my activism when I’ve said that I respect the 2nd Amendment. Despite the times I’ve said I don’t want to take away your guns. Today I would do exactly that. In the midst of the endless the back and forth about what the bible says about protecting ourselves. Or about whether the 6th Commandment is translated do not murder vs. do not kill. Or about how Jesus wanted his disciples to carry swords. Or a debate about turning the other cheek is just about a reaction to a verbal insult but it has nothing to do with shooting someone you decide is threatening. I don’t want to hear it. Any of it. I’ve given testimony in many places since 2012 when I started my gun violence activism saying I do this work for children. For the children I pastored in my church, who not only know how to do a lockdown drill, they’ve known real lockdown. Every single child. This is their reality. Because I’m a Christian and because I’m a Christian leader, it can’t just be about the children I know and love. I must do this work for all children. So they will grow up. So they can thrive in a learning environment without the threat of guns. What I’ve not been as vocal about are children who are all-grown up. In their 20’s. 30’s. Finishing their educations. Starting their careers. Living their lives. The ages of my children. Through a mother’s eye, I can still see them on their first day of kindergarten, even though I know that was years ago. From my mother’s heart, I know to encourage their steps out into the world, while also wishing sometimes that I could take those steps with them. And so I do this work also for: The 32 Virginia Tech students killed in class one horrible day. The young adults taking in a midnight showing of a Batman movie in Aurora, CO. A young reporter and a cameraman just doing their jobs on a Wednesday morning. Any one of those young adults could have been my child. Or your child. At what age do they stop being our children? A gun death is tragic no matter the person’s age. And 88 gun deaths every single day in our country is a number that is ever before me. But today I am especially saddened by the vastness of stolen years. Years that will never happen for the 20 first-graders in Newtown, for 12 year old Tamir Rice, or 17 year old Jordan Davis, or 24 year old Alison Parker. Sadly, I could name so many more. Whether it was their parents’ dreams for them or the ones they had for themselves, those dreams are lost forever. Stolen by a gun. There’s a website I’ve looked at a few times. I’d not thought of it for awhile until today. 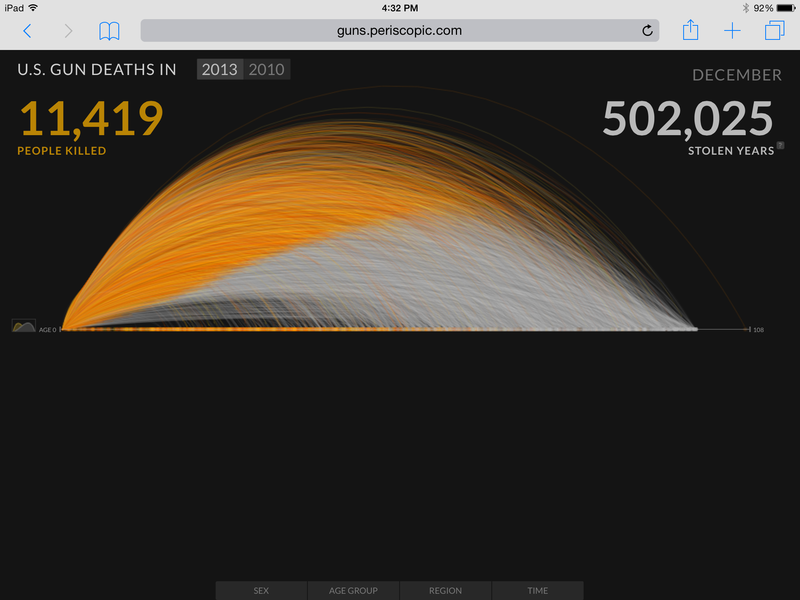 It takes the number of gun deaths in a year and calculates how many years were yet to be lived. Stolen years. Today I looked at it and cried. I saw in a glimpse where there will be no careers. No midnight movies. No engagements. Or parenthood. I invite you to take a look for yourselves. Give it a minute to get up to speed, and then watch in amazement at all the life that is being taken from us. While you’re watching the stolen years climb, put your cursor at any point on the curve and see a real name of a real person who died because we can’t figure out how to enact even common sense gun regulations in our country. I hope it brings a reaction whether it be tears or prayer or shaking your fist and yelling at the top of your lungs. At anyone close enough to hear. Or at God. I hope you’ve had enough that you’ll decide to do something. This entry was posted in Activism, Ending Gun Violence, God Before Guns, Grief, Loss of Child and tagged #NotOneMore, Activism, Child Access Prevention, Ending gun violence, God Before Guns. Bookmark the permalink. Thank you. I needed to read your words today.I have struggled with the lack of any gun control action since Newtown. So, so angry and frustrated. Please, please keep giving us a voice regarding this issue.